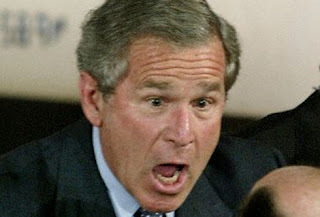 George Bush is SHOCKED at how long it's been since I've posted! Forgive me, blog, for I have sinned. It has a WEEK since my last blog post. (No offense intended for any Catholics who may be reading this.) Yikes, I guess I've fallen way behind on that "blog every day" goal. Oh well. Why is that since hubby has a job I have been writing less? I guess maybe it's because I've had less free time too. Well anyway, I figured I better get on here and write for several reasons. One, because as my Aunt was saying "she doesn't pay me for nothing!" Oh wait...she doesn't pay me! Hmmm. Well, moving on. I've had lots of ideas swirling around in my head for different blog posts - I just haven't had a chance to write many of them down. It seems like (with me, anyway) that if I get an idea, I have to write it down right then or it's gone. I don't know why that is. Lastly, I have fun reviews that need posting! Yay! So just what HAVE I been doing for the past week or two besides slacking on my writing? Well, the weather has been loopy here in the good 'ol Hoosier state. The ice and snow started melting, it rained, it was still pretty cold, though...then I woke up one day last week and my son was telling me how it was "practically Spring" outside and that we HAD to go get his bike out so he could ride it. (He's been waiting since Christmas to really try out the new bike so of course I complied.) And wonder of wonders, it snowed again today! Indiana truly is the Bi-Polar Weather State. I have kept busy with homeschooling, babysitting, trying to decide on a First Grade curriculum, watching too much Food Network, going to a wedding for some of hubby's family, holding a witty bitty baby (SO CUTE) at previously mentioned wedding, taking care of the kids, spending the wee hours with hubs since he's working so much, getting ready for a home party with my friend who recently started selling 31 Gifts, helping hubby with his homework and failing at housework trying to keep up with the housework. Whew.